Help CentreUsing SuperControl Tactical pricingHow do I set up and use price seasons? Price seasons allows you to copy specific date periods and prices to specific properties. For example, if you have multiple properties with the same prices, you can easily increase rates across all of these properties in these simple steps. 1. Go to Properties > Price Seasons. 2. Enter a pricing group name eg. High season prices. 3. Select if you wish to also include short break prices and click Save. 4. Add season name eg. “June - August” and enter in the prices for that that period. 6. Select your start and end date for this period eg. 30th June > 31st August. 7. Click Add date range. You then have the opportunity to add additional date ranges eg. Christmas and New Year. 8. To set these prices against multiple properties select Copy to and select your parameters. 9. If you select Individual properties, select multiple properties by holding Ctrl/Cmd and clicking on each name. 10. Click Copy prices, then click OK.
To make sure your prices have copied correctly, you can view the prices within Properties > Edit > select property > Price planner > Go. Prev: How do I add per person pricing? Next: How can I add special pricing? I want to set up prices for 2019. Can I do it through this system or is it better to use the price planner? You can do either way. 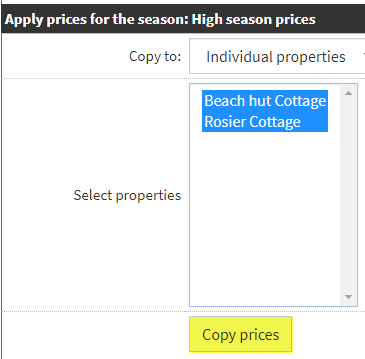 Using price seasons would be a better option if you wanted to copy the 2019 prices to multiple properties to save time as this feature is available here. Both methods will populate the Price Planner so it just depends what way is easiest for you. If you require further help please let us know. I'm not sure what you mean. Do you want to connect to a different price model? If you contact support@supercontrol.co.uk they will be able to help you in more detail.